Tulips, lilacs, peonies, delphiniums, sweet peas, asters, zinnias, and many more flowers. All have their seasons. Beauty of the Earth offers them at their peak, as stems and as artful arrangements. In Robbinston, Maine, near the Canadian border, Beauty of the Earth ships cut peonies in season, wholesale and retail. Local folks can order weekly home deliveries of mixed flower bouquets through Friday Flower Delivery Service. 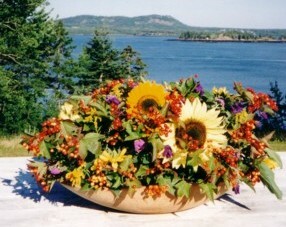 Special Occasions call for bounties of locally grown flowers arranged personally for the event. Individual fresh stems and arrangements and dried flowers wreaths are available at Sunrise County Farmers' Market. Dried flower wreaths can also be ordered directly.